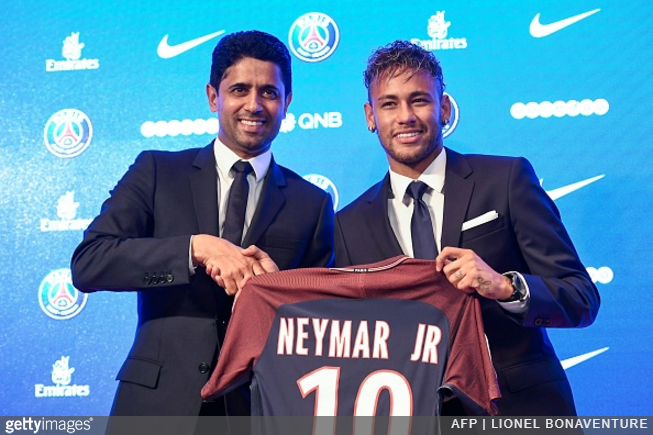 PSG have unveiled their new £196million plaything to the world, with Neymar getting his hands on his new work uniform for the first time at an introductory press conference in Paris. The Brazilian joined PSG president Nasser Al-Khelaifi for a natter, wittering on about ‘new challenges’ and the like. A marriage made in corporate heaven. I think it’s pretty awesome to be honest, I’d love to see PSG with 6 Brasilians play in the UCL this time around, With Neymar they wouldn’t lose a 4-0 agg. This season will be a good one for all the big leagues. He’s leaving Spain to get away from the tax investigations. Do you know brazilian government has confiscated some $100m from Neymar? Helicopters, planes, apartments… he owes more than $100m in taxes here in Brazil. His whole career is marked by laundered money. His father is a criminal.